The WAVES base newspapers also reminded women of what they had left behind. 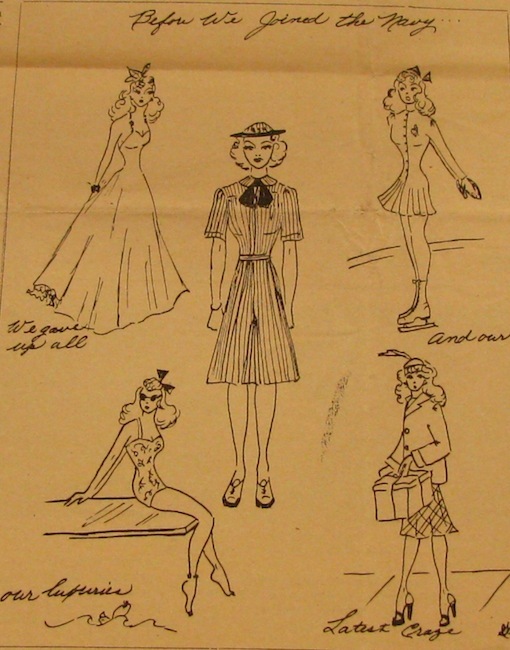 In this comic, a WAVE (dressed in her summer grey seersucker uniform) wistfully remembers the fashions she was able to follow before joining the WAVES. Before thinking that the comic was criticizing the uniform, remember that the WAVES’ uniform was couture-designed by the famous designer Mainbocher – and that while WAVES did wear a uniform on the outside, they could choose their own nightclothes and undergarments. This comes from the archives at the University of Northern Iowa.